I have never read any books by Jennifer Donnelly, so this book was an experiment of a sort. Disney-Hyperion surprised me with a copy of this book, and I almost decided not to read it, since it was an unsolicited copy. I have a ton of May review books (especially May 6th releases), and the ones I requested get priority. However, I couldn’t resist the siren’s call of fantasy, even if it isn’t the usual type of fantasy I love (epic fantasy). I am pleased to say that overall, I enjoyed this book. It was relatively short, and there was a lot of action and revelations and things occurring. Okay, so I found the plot a little bit generic. The uniqueness of the characters and world-building (for the most part) sort of made up for the cliché plot. The thing I really liked about this book is that it focused more on friendship than romance. At first, it seems like the romance will be more important than anything else. Serafina is preparing herself to be shown as the next heir of Miromara, and to exchange marital vows with the crown prince of the kingdom’s choosing – Prince Mahdi. The prince and Serafina were always arranged to be married, but they fell in love after a visit or two years ago. Years later, Mahdi has changed, and is now a player and a jerk. So, you would think that the romance was at the forefront. Serafina is still very much in love with Mahdi, he’s in love with her, and they’re getting married, no matter what. But terrible things have happened, are happening, and will happen to the mer kingdoms. Someone is taking merpeople, and a monster has been unleashed. Sera, her friend Neela, and four other girls must are called via dream to come together to fight and take back the sea. Friendship is key in this book. The bond between Sera and Neela is unshakable, and I love that this is an important aspect of the book. I know that we will see more of the six girls together in the next four books – they only come together in one place at the end of this book. I love how well-characterized the girls are. Each girl is different, and fits their respective “gifts”. We get to know Sera the most – she is selfless and responsible, cautious and brave. Neela is fiery and hilarious – I LOVED reading the parts of the book that involved her actions and dialogue. I’m hoping to see more from the romance in the next few books. It wasn't huge in this book, but it is still important. I have a feeling that someone in actually someone else in disguise… ahhh, I want to say more but that would be spoiling things! I shan't give anything away! Now, onto the plot, and what I didn't like. As I mentioned before, I found the overall plot of the book and series to be cliche. People are murdered or taken for the greed of another, a giant monster exists and is out for blood. Several teenagers must save the world. It’s very overdone and cliche, but especially in certain types of fantasy. The paranormal type of fantasy (like this book) always seems to follow this plot, to the T. Especially with the monster part. And the fact that each teenager has a unique skill or power. You might say that every book or plot is a bit of a variation of another, but I find that this type of plot is highly power in paranormal and fantasy novels, and one after the other after another isn't always smart. I would definitely recommend this book to fans of fantasy novels. It’s not the typical type of fantasy that I read and love, but then, I love most types of fantasy. Mermaid books aren't really my thing – I kind of liked Anna Banks’ series (here’s hoping Of Neptune is really good, to redeem the series), and I wasn't a huge fan of Lies Beneath by Anne Greenwood Brown. But this one was pretty great! So fantasy lovers, paranormal lovers, this is one for you! If you have a copy, or were already planning on reading it, definitely do not hesitate to do so! 3.5 stars -> rounded up to 4 stars. This was a pretty great start to a new series! I will definitely be catching the sequel, and most likely the two books after them. I cannot wait to see what the imprint of Disney-Hyperion will be! This is the first book to be published by the imprint, so that’s exciting. Hmmm, I'm not big on mermaid books myself but this sounds interesting since the friendship part is even more important than the romance part! Yes, that was probably one of the most well-done parts of this book! Although now I want to see more of both - friendship AND romance. I love the setting of this, I've never read a mermaid book before though. Happy to see you liked it! I have never read a mermaid book but this sounds interesting because it was focus on female friendships rather than romance. I may just pick this up. This might be the one with which to start! I like that more books in YA literature involve deep friendships in addition to the romance. Awesome! YES! Me too! I totally get you though. Thank you for sharing your thoughts! Awesome review Alyssa! I actually have not read a mermaid book yet and I've been dying to get my hands on Anna Banks books for so long now but I am glad and happy you like this one it looks and sounds like a great fun read! thanks for sharing Alyssa! Anna Banks' series is a good one, from what I've read so far! I haven't read Of Neptune yet though. This is a great start to a new mermaid series! You're welcome - and thank you! 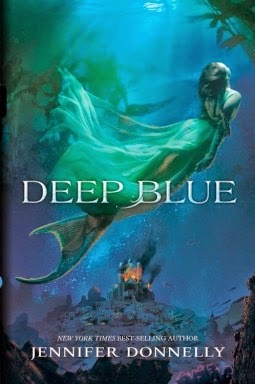 I love Mermaid books, and I am dying to read this one! I have heard mixed reviews but it is good to know that you liked it!! !